I was timing a 5K / 10K running race with Elevated Racing this morning near Deer Creek (where I happened to see fellow swimmer Nathan Nelson) and decided to take a quick dip with my brother after the race was over. The original plan was to swim around the island a couple times, but the water level has gone down since last time I drove by and there wasn't enough water to get around the island. We decided to drive further down the road to Rainbow Bay. It was pretty windy by the time we got down to the water. I didn't take a water temperature, but it felt great. If I had to guess, I'd say low to mid 70's. Time was somewhat limited today so I just swam for 15 minutes around the point, took some cheesy pictures, and turned around. On the way back a boat stopped 25 yards ahead of me and just sat their with their engine running, making me swim through the exhaust. I want to yell something at them, but saw that it was an older guy driving and decided to hold my tongue. I was experimenting a little bit with pacing today. 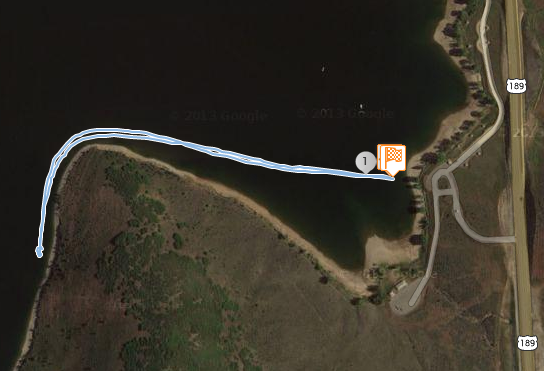 I have the Dam 2 Dam swim coming up and I don't really feel totally prepared for it. I was trying out different stroke rates to see what felt most comfortable. I plan on taking that swim very easy. The swim today was short and very sweet. A nice little distraction from all the things I have going on right now.